You have many options when it comes to selecting a Columbus roofing contractor for your home or business. But to get the highest level of both quality and service, your best choice is Muth & Company Roofing. Here are five reasons why we are the right choice for your Columbus roofing project. Experience – In 2018, we achieved the mark of roofing Columbus area and Central Ohio homes and commercial properties for 27 years, and many of our staff members have been with us for more than 12 years! Reputation – We’ve earned the trust and respect of every one of our customers by delivering superior service and quality products — roofs, gutters, insulation, and more! Education – Our staff members undergo extensive and continuing training and education on the latest and best roofing practices. Selection – As a certified contractor for both GAF and CertainTeed, we can offer you a wider choice of Columbus roofing products and styles than other roofers. Guarantee – We offer the industry’s best product warranties and our own workmanship guarantee. We want to thank homeowners in central Ohio for entrusting us with your homes, and for recommending us to your friends and neighbors. Your home may be your most valuable financial asset. We know you have a choice of Columbus roofing companies, and as you can see on our customer reviews page, we strive to be the best local company you’ll ever hire. After roofing Columbus area homes and businesses for 25 years, we know what it takes to continue being the premier roofing contractor in Columbus, Franklin County, Delaware County, Licking County and surrounding areas! Muth & Company Roofing is a proud supporter of the 2nd and 7 Foundation program to “tackle illiteracy” in central Ohio and around the nation by providing free books and positive role models to kids in need. We also support a wide variety of additional local causes. ROOFS FOR TROOPS: Special Rebate for Active Military, Veterans & Retirees! Muth & Company Roofing is proud to extend a $250 rebate on a Lifetime Roofing System from GAF to those who have served our country. To our brave men and women — thank you for your sacrifice and your commitment! As an American-based company and the largest roofing shingle manufacturer in North America, GAF and Muth & Company are providing this offer for new customers only, now through December 31, 2016. 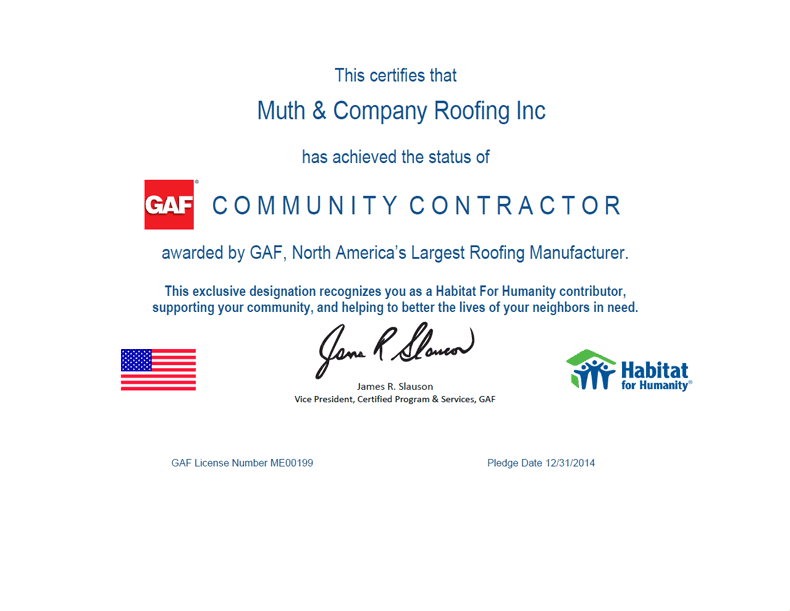 Ask your Muth representative for more details or visit the GAF Roofs for Troops page. Muth & Company took this photo of troops from the 101st Airborne from Ft. Bragg visiting Gettysburg. Call Muth & Company Roofing today at (614) 682-3060 for a FREE estimate on Columbus roof repair, Columbus roof replacement and Columbus chimney repair — or complete the form on the right side of this page — and we’ll contact you to schedule an appointment.